I am terrified of the open catwalk we have upstairs. The rod iron railing only comes up about 4 feet. Any ideas on how to make this spot safer? The catwalk is always scary for parents, especially in a new home. 4 feet is actually standard, but there may be a few ways to make that safer. I would maybe consider drawing attention to or away from it. Maybe on the hand rail that’s not going down the stairs try to string some lights? That makes it harder to imagine trying to crawl up on and it’s also pretty. If you don’t like that idea, try to focus somewhere else. When you have younger children, they have specific likes and dislikes. I myself am not a mom that likes posters, but maybe you can create framed posters or large prints of their favorite characters from shows. Hang those up on the wall opposite the rail or at the end of the hall. It could work as a focal point for the kids. Side note: Our toddler is a climber, and that desk chair was freaking me out. I didn’t want to do away with it because the big kids love sitting there and drawing, but I was terrified of the idea of him pushing it over to the railing. So we bolted it to the desk with a safety cable. Our toddler is also a marker ninja and loves to tag furniture. Talk to me about making 2nd floor windows hard for kids to get out of without keeping them from being opened by rescue workers in case of an emergency. I would look at Home Depot or other types of hardware stores. They provide new windows or safety locks you can add to them. You may want a mesh guard, something that needs two hands to open at a time inside, but not impossible for a fireman to open from the out. KidCo.com offers a ton of safety features for many parts of your home. They have mesh window guards and safety locks called a “window stop.” Also, Guardian Angel Window Guard received good reviews, and the guards appear to be easy to install. On that note, what are some tips for a family fire safety plan when children are sleeping on the 2nd floor, and mom and dad are on the 1st floor? The hardest part of a fire plan is always having clear hallways. It’s amazing the kind of mess one child can make in five minutes! Something you can do to help every day is after you tuck your little ones in, clear the hallway. Clear a walk path in their room. Make them and yourselves as accessible as possible. There is a great list on www.mysafela.org. I found PEARL ladders that look easy to install in any 2nd story room. They received great reviews on Amazon. Any other concerns I may be missing? 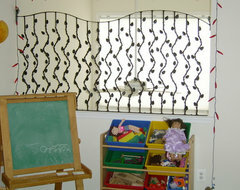 Depending on how old your children are, you may or may not have a safety gate. However you should always keep one. You never know if a toddler will come to your 6 year old’s birthday party, or when you may have a visit with friends with even younger children. Keep a safety gate at all times. After living here a few months, I will say we are easing into this place, and the kids seem to be respecting the boundaries and understanding the need to be safe upstairs. I still get the occasional shiver when I think of the “what if” scenarios, but I’m mostly okay. We totally need to buy those fire escape ladders though. Previous ArticleHurry! Before he gets here! Why Chuck E. Cheese needs to ditch the rat. Next Article I Try To Stop Time When You Sleep. It’s Filling Up My Camera Roll. I think some sort of credenza would block the iron without providing an obvious stepstool until the daredevils are old enough to know how serious it would be to fall from the second floor. First, I LOVE your house. It’s gorgeous. But yeah, as a mom, I’d be terrified of that catwalk. I also agree with Haley, distraction technique is probably useless. I’ve had the “luck” of having 3 climbers and distractions have never helped. Great idea on the chair safety cable as well. We have a big pass through “window” between our living room and kitchen. After my oldest decided to climb the couch and onto the bar too many times, I put up a baby gate. 2 years later, the twins took it a level further and constantly reach through, spilling or pulling back whatever they can reach. We got a piece of plexiglass and zip-tied it to the gate. Best thing we ever did. We can still see through, but they are totally blocked. I would plexiglass that catwalk in a heartbeat. Our family had the parents’ room downstairs and my room upstairs — we definitely did a lot of talking about fire safety, play acting fire drills, etc. Especially because the windows on my particular room were over a walk out basement side of the house and more than 3 stories up = no jumping out the window under any circumstances even fire. I did find it kind of strange that they would put me up there with no hope of escape. Maybe they were trying to tell me something?? Or thinking ahead to the teenage years?? I was just thinking about options for our bedroom windows the other day. It wasn’t a huge concern for us when our daughter was a toddler because she wasn’t a climber or a risk taker…the boy child is a whole other ball of crazy. I have these images of him punching out the screen and gravity taking hold of his giant head. This is a good product if you want to stop your children from falling from 2 floors. These safties can help very much. If you are from Singapore you can also order or call professionals to take care of your locks.